All in one - Whey Protein, carbohydrates, BCAA's and minerals. 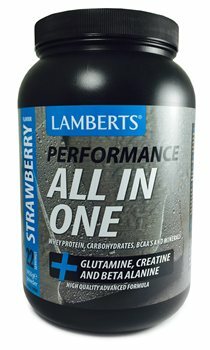 This is one of the UK's best All-In-One formulas delivering 38g of premium quality protein per serving, sourced from a unique blend of whey protein concentrates and isolates. Also added a massive 6g per serving of BCAA's and boosted the glutamine level so that each serving also provides 6g. The creatine level at 6g is double what is provided by some All-In-One formulas. The high level of carbs per serving is an excellent energy source for training. We've also added a decent level of electrolytes to replace salts lost during exercise. Protein Blend (Whey Protein Concentrate*), Whey Protein Isolate*, Emulsifier: Soya Lecithin), Maltodextrin, L-Glutamine, Creatine Monohydrate, Mineral Blend (Magnesium Phosphate, Tri-Calcium Phosphate, Di-Potassium Phosphate, Sodium Chloride), Flavouring, Citric Acide, Thickener (Guar Gum), BCAA's (L-Leucine, L-Isoleucine, L-Valine), B-Alanine, Colour (Beetroot Red), Sweetener (Sucralose). Take as above or as recommended by your practitioner or pharmacist.